kyklosphaira wing tsun kung fu blog: How sticky is your Wing Tsun Wooden Dummy? How sticky is your Wing Tsun Wooden Dummy? 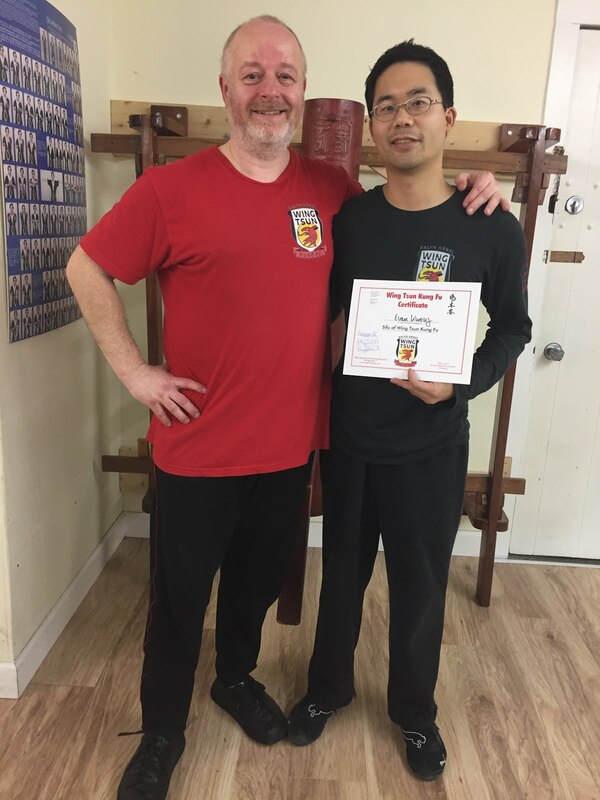 Si-Fu Ralph Haenel of Wing Tsun Kung Fu Vancouver blew us away in 2014 with multiple seminars. In addition to reviewing Chi Sau sections, we had various firsts: Long Pole and Bart Cham Dao. If that was not enough, in 2015 Sifu Ralph started teaching us Wooden Dummy Chi Sau sections. Certainly, we have had classes before about applications from various parts of the Wooden Dummy form. Also, one could also argue that sections are just created and not needed. But everything we do is fabricated. There must be a reason? The more obvious reason is that the sections again allow a catalogue/reference point, just as the other forms and Chi-Sau sections do. It is also how amazing that all the training programs link together very well. More importantly, as with everything we do in training or learning, there must be some translation to applications or improvements to our Wing Tsun (or whatever you are training for). So, over the last month I have been trying to formulate how the Wooden Dummy Chi Sau sections help us improve. I think this will take some time though, to digest and analyze (probably a lifetime). One of the key ideas I’ve had is: Cross-referencing. Time and time again we work on forward pressure. I found that this section helped once again emphasize the importance of forward pressure that deflects yet redirects at the right moment. That right moment was more prolonged in the other sections. With the Wooden Dummy Chi-Sau that time period for deflecting/redirecting seems much shorter. With the goal of being more direct and effective. Are we able to translate this concept and improve other WT skills? Many of the movements in the Wooden Dummy Chi-Sau sections are already shown in various other training, including the 3 forms, different programs (e.g. BlitzDefense), various exercises (e.g. Student level 3 Pak-Sau), or Chi-Sau sections (e.g. Section 1 Fook Sau cycle). But, just as how training Biu-Dje Chi-Sau should change the way we move or function, shouldn’t training Wooden Dummy Chi-Sau also do the same? I think it will change the way we move. So much that, in a sense, it isn’t necessarily a visible change but one that the opposing partner/opponent feels. At least when we get through the visible growing pains. So, in the end, it won’t necessarily be a “Wooden Dummy technique” that is used, but so-called “Basic” ones that are done with that structure, form, and added shocking-power all gained from training on the Wooden Dummy, the Chi-Sau sections, and applications. The theory I’ve heard before is that the Bart Cham Dao and Wooden Dummy has “advanced footwork.” Yet, in the early student programs, we work on: forward step, turning stance, 90/180 degree turns, zig-zag step, crossing step, etc. They are all there. Why should we be excited to learn Wooden Dummy Chi-Sau then? Because it is awesome and higher-level and we are now all close to being masters, isn’t it? Well, if we can’t drive an old VW Beetle, we can’t necessarily drive a Ferrari well. So, I guess the lesson is don’t forget the basics. Yes, that pair of Bart Cham Dao is sitting on the couch and very accessible to pick up and practice the form. But what about those footwork drills, or those “basic” exercises from the 21-Steps Seminar? In Chum Kiu training we learn to seek the bridge or building one. Hopefully only a 1-way bridge, for us. In Wooden Dummy training it appears that there can be often a (physical) disconnection, followed by a re-connection via another bridge. Hopefully again a 1-way bridge, for us. I think it would be useful to go back to the foundations of Chum Kiu and understand what makes a good bridge. Then revisit the Wooden Dummy applications again. Practicing the dance but not the applications. Do you remember first feeling awkward with Chi-Sau? Then it becomes easier, and then you start learning the sections? I can still remember testing for student level ?6/7 with the first WT Chi-Sau section. Did it so smoothly, just like a well-oiled machine. Of course! Because I tested with one of the same training partners I trained with day-in and day-out. Practicing choreography is no different. Did I know how to apply all the parts? Perhaps partly, but of course, years later on looking back, not as effective as I could have been. An obvious tip that can help? Train with different partners, of different sizes and strengths/weaknesses. It’ll open up new “mistakes” and prevent us from practicing choreography.